All photos by Patrick Phillips, director of photography at Team Biscuit Films, LLC. On June 10 to 14, 2015, Mondial de la Bière celebrated its 22nd annual “World of Beer” Festival in Montréal, Canada. Located at the Palais des Congrès in the city’s downtown district, the festival joined together beer industry veterans, media personnel, tourists and local consumers for a five-day celebration of unique beers brewed in Canada and around the world. A total of 85 breweries exhibited at the international expo, with 40 microbreweries from Quebec alone touting 226 new brews never before seen or tasted at the Mondial de la Bière. In all, 523 beers, meads and ciders were served, with beer alone comprising of 475 sample products. As guests of Ale Street News, journalist-photographer team, Patrick Phillips and I took on the massive exhibition with vigor. Armed with our media bracelets, mugs and map of the festival’s indoor and outdoor floor plans, we captured as much as we could of the brewers, products and attendance on the show floor, the fine rare beers available in the VIP lounge, and the general essence of the final weekend on Friday, June 12 and Saturday, June 13. Please enjoy the photo gallery below, showing our journey from our first day in VIP, our introduction to the main event, some standout brewers, beers and cheese, and an overall glimpse of the mind-opening, palate-expanding experience of Montréal beer. Photos by Patrick Phillips. To view the slideshow, click the first image below and use the arrows to scroll. My mug is empty, but I’m excited to try what’s next. Cervejaria Colorado (L) from Ribeirão Preto, SP, Brazil was another personal favorite. Montréal’s Dieu du Ciel! 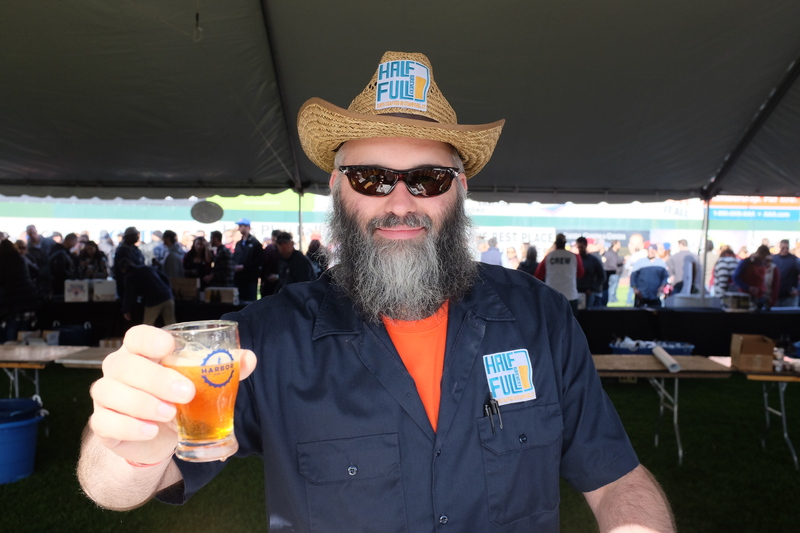 brewpub was another standout brewer at the event. A selection of Red Racer offerings from Central City Brewing. The perks of being press: as we worked on our stories and appetites, bread and local cheese was available to soak up those 4oz tastes. Did I mention there was complementary beer, bread and cheese? A favorite of the photographer: Muskoka Winter Beard Double Chocolate Cranberry Stout, an imperial stout brewed by Muskoka Brewery in Bracebridge, Ontario. Another from Muskoka to regret not doubling up on: the Twice As Mad Tom IPA, an imperial IPA aged in cognac barrels. Think about that! We were lucky enough to snag two of the last tastes of this Brazilian whale: Tripel Hop Montfort, a Belgian style tripel by Cervejaria Bodebrown in Brazil. (L to R): Cat Wolinski, Beer Affair and Pat Phillips, cameraman and co-founder of Team Biscuit Films check to make sure they are really here. Pat goes in for his first taste of Montréal beer on the show floor: Saint-Bock’s Malédiction, a sweet stout served with a marshmallow garnish. Taking notes on our first two tastes at the Saint-Bock booth. Hopfenstark cheerfully lured us in to try some rockin’ sours. To our pleasant surprise, Hopfenstark brewer, Fred Carmier showed us the full spectrum of his current and vintage sours, some harking back from as long ago as 2007. Pictured middle and right are two iterations of the Cassandra Complex sour blend with oak aged raspberry. Alaen Ouellet donned a Station Ho.St DIY horse costume. At least Fred was amused. The last stop on our Hopfenstark journey was the magical, balanced imperial stout, far from the flavor profile of the first sour. We could smell Alexander Keith’s of Nova Scotia from a mile away…in celebration of their new Hop Series, the commercial brewer’s truck sent boiling hops and mash wafting across the show floor. A miniature brewery set up in the Keith’s truck. Les Trois Mousquetaires, or LTM, brought several samples of intriguing brews from their brewery in Brossard, Quebec. Pat sips on LTM’s Le Meilleur Des 2 Mondes, a double IPA/Baltic porter blend served on cask. Brutopia taps are clearly labeled but not clearly defined; a quality found in many of the unique styles available at Mondial de la Bière. Brutopia poured us their Hoptimus Prime and Blackout IPA. A local consumer learns about the range of beers available at Brasseur de Montreal’s three locations. Brasseur de Montreal owner and brewer, Marc Andrew Gauvreau (R) is joined by his cousin, who wore a kilt to the festival. The true meaning of “grilled cheese” is Fleur St-Michel’s cheese grilled on a stick. Behind the bar of a Mondial de Bière vendor. Taking notes on the outdoor patio of the VIP lounge during the Ale Street News reception. Of the many food vendors available in the outdoor section, poutine was a must. The magical oasis of the Palais de Congres’ outdoor patio. A couple (and many others out of frame) took to sitting on the wall inside the building. A panoramic view, Mondial de la Bière, 2015. Ex Novo Brewing Company. Photo via Facebook. Every brewery has its own style. There are the science buffs, who rely on organized spreadsheets, strict ingredient measurements and counting yeast cells in a petri dish to make sure attenuation is just right. Then there are the artistic types, who rely more on “feeling” and inspiration to create new brews on the fly. Then there are craft brewing’s political moderates, who prefer the level of organization necessary to keep a tight ship running smoothly, and are also ready to change course if a recipe route isn’t leading to the right place. 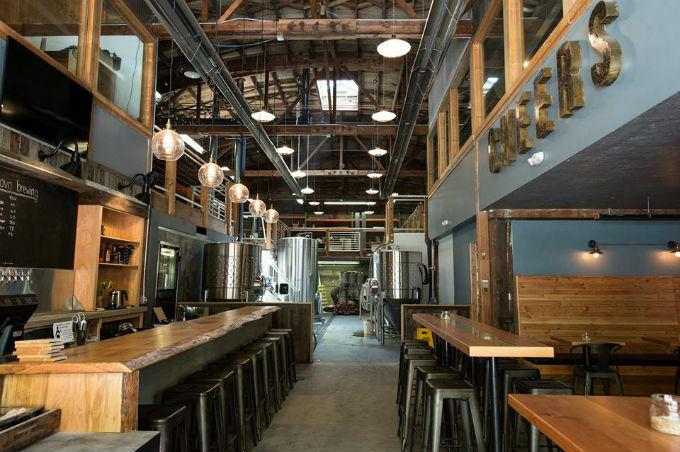 At Ex Novo Brewing Company in Portland, Ore., Jason Barbee is somewhere in the middle. Part scientist, part creator and part innovator, Barbee is the loveable mastermind behind Ex Novo’s new brews, which run the gamut from traditional Northwest amber to a saison packed with jackfruit. One thing that’s certain is, he’s here to mix things up. Ex Novo Brewing Company opened in July 2014 under the direction of Joel Gregory, a young, even-tempered engineer-turned-brewer who gives the striking (albeit unlikely) impression that he opened this business overnight. The industrial space is sleek while welcoming: over the bar, a versatile beer list hangs over a row of just-cleaned taps; an equally adaptable food menu on the bar displays upscale-made-affordable small plates and sandwiches; and, neatly placed without sterilely uniform, high rectangular and low circular tables fill the majority of the front space, with booths against the wall, and kitchen hidden behind and a well-maintained brewery in back. The brewery’s name, “Ex Novo,” is a Latin phrase translating loosely to “from scratch”—an appropriate epithet for a business conceived of and set afloat with little guidance—and virtually no brewing experience. If it’s a creative business he wanted, that’s certainly been accomplished—on top of his unbiased, nascent perspective on professional brewing, Gregory is planting a flag in wholly unchartered territory. Ex Novo is not only built “from scratch,” but is “the first and only nonprofit brewery in the country,” he tells us. After taking salaries and brewing expenses out of business revenues, his profits go to a selection of community-serving organizations that need money more than he needs a bigger house or new car. 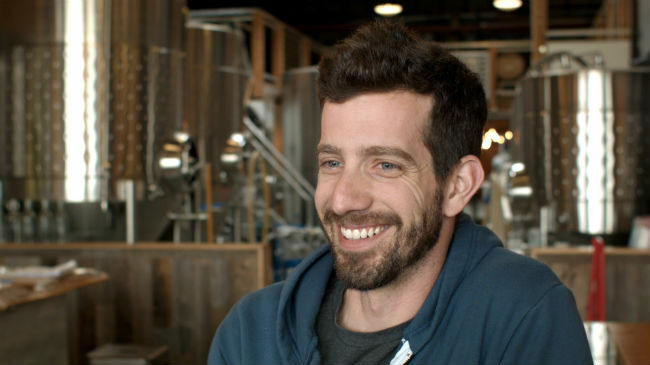 Joel Gregory, Ex Novo Brewing Company founder and president. According to Gregory, the way to “do it right” is “being consistent and solid, and building something that people trust.” That’s hard to measure after just eight months, but being trustworthy is built into his business model; Ex Novo currently holds a commitment to four regional and international nonprofit organizations at $25,000 each, and has chosen a head brewer who has over six years’ experience at one of Portland’s craft beer mainstays, Deschutes Brewery. The brewery currently runs as a three-man show with Gregory at the top as founder and general manager, Barbee as head brewer and Tommy as assistant brewer. In Gregory’s words, the brewery specializes in “lean, drinkable beers” that “occasionally get weird”—a description that may be hard to understand until you’ve tried them. “We try to have something that anyone can walk in [and enjoy], whether they’re the farthest spectrum of beer geek or total novice,” says Gregory. He and Barbee agree that Ex Novo should, at least for now, incorporate a mix of styles agreeable to Portland’s many discerning palates. “We want to do those things and do them really well,” Gregory says. Currently, that translates to brews like Damon Stoutamire, a balanced stout with dark chocolate, roast and slight coffee ntotes; How the Helles Are Ya’, a crisp, light lager with full body and German beechwood smoked malt; the self-explanatory Hoppy Pils; and Red Red Wheat, an amber wheat ale brewed with specialty malts and hops yielding sweet caramel and finishing off with a hint citrus. In case you think you’re getting the picture, there’s also the game-changing Jacked-Up Farmhouse, a fruity sour beer brewed with eight gallons of jackfruit, the origins of which beg an entire story of its own. In other words, we’d say the new breweries beers surpass “drinkable” and lean more toward novel, fresh and inventive. 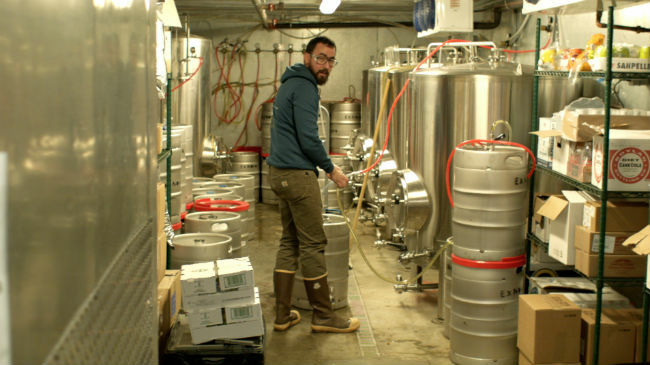 Ex Novo Brewing Company head brewer, Jason Barbee, caught in the act of tap cleaning. At the time of our visit, on March 20, the first day of spring, Ex Novo has a few fermenting beers on deck that evidence its—and Barbee’s—versatility when it comes to an inaugural spring lineup. There’s a Maibock in one fermenter, readying itself for a lagering period that will precede its release in about six weeks; there’s a not-yet-released two hop double IPA that’s now, as I write this, on draft as Dynamic Duo IIPA, and in another metal fortress is a soon-to-be Belgian wheat with lime and juniper, meant to emulate a gin and tonic. The best seller, Barbee says, is the Eliot IPA, a creation he admits is not yet perfected. It’s also the one he brews the most, exemplifying why Ex Novo is the right fit for him. “[Portland has] a really interesting beer scene because we really have the best of the best in terms of all the raw materials. Hops are all grown very locally, within driving distance…Wyeast is, in my opinion, the best yeast lab and they’re an hour from here. We have really good water. Great Western Malting and Country Malt Group are 10 miles from here. We have very good access to very high quality ingredients and lots of them. Though his family lives in North Carolina, Barbee has had no temptations to leave the Portland craft beer scene. “[The North Carolina beer scene] is really cool and growing a lot, but it’s a decade behind the scene here,” he says. Well played, but we sense another beercation in our future. 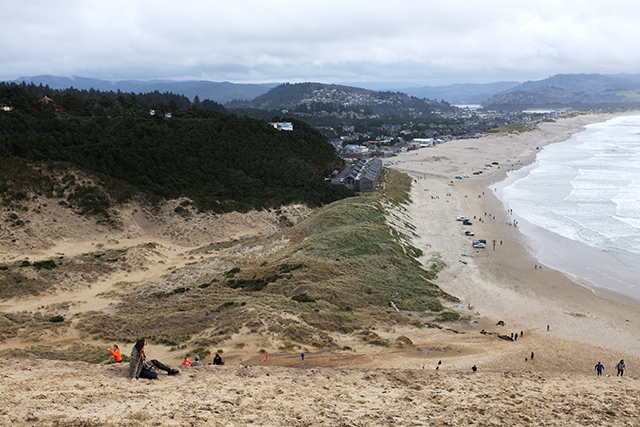 View from the top: sitting atop the hill at Cape Kiwanda; Pelican Brewing Co. is in the distance below. 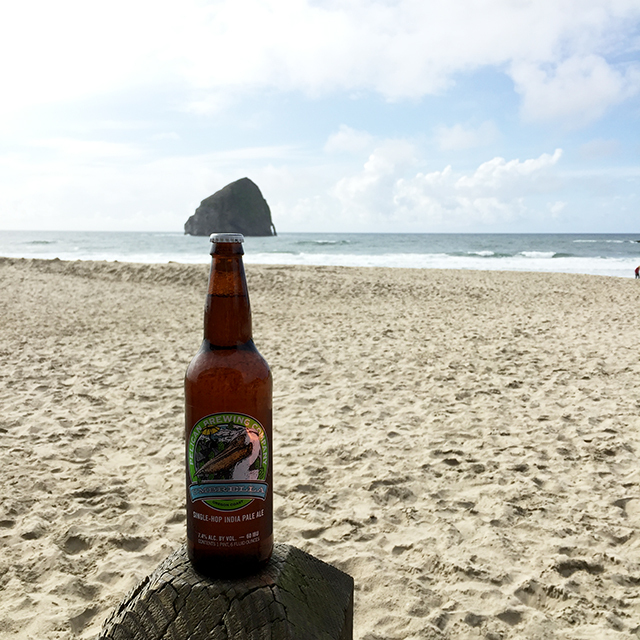 Pelican Brewing’s Umbrella IPA, the new single hop spring seasonal in Cape Kiwanda, Pacific City, Ore.